Home entertainment networks are becoming increasingly common, but can be a challenge when you want to use devices in different rooms. Unless you live in a home with pre-wired, high-capacity Ethernet getting data around the house without pinning cables along the skirting board can be a challenge. Wireless is simple and good enough for internet browsing, but it lacks the data rates for reliable media streaming. But every home has at least one wired network with points in every room on which you can piggyback a high bandwidth network - and that's the mains power. 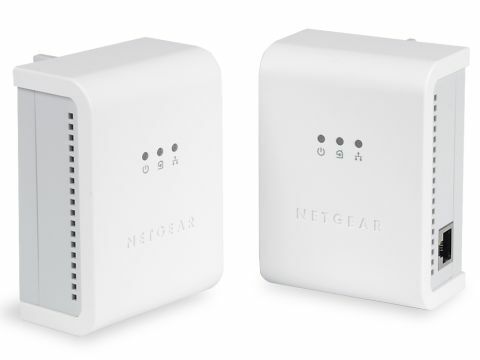 Netgear's HDXB101 is a powerline network starter pack that brings serious, practical bandwidth. The two units plug into standard wall sockets (strip adapters interfere with the operation), and you can have up to 16 on one home network. The data is automatically encrypted, and you can give your network its own identity, so no one can read your data if you share a mains system. The devices just plug in and recognise each other with no software to install, although there is a management utility you can use to monitor them, change settings and update the firmware. Powerline HD is a new system, promising a theoretical top speed of 200Mb/s. In reality we got about 80Mb/s, but this easily beats Wireless G and is enough for several HD video streams. By default they're set to prioritise video data, and we noticed an instant improvement to the response time and reliability of our Pinnacle Showcenter, with no trouble streaming HD video clips, even while we surfed the net. There are a few bugbears; each adapter takes up a power socket, and they're often in short supply. Also, if you upgrade the firmware, each one has to be updated via a direct cable connection from a PC, instead of one device propagating the latest fi rmware across the network. However, if you've already started wireless networking with the earlier Homeplug 1.0 standard devices, then bad luck; Powerline HD can co-exist with that network on the same mains supply, but it won't interface with them.